Course management as a skill is underrated by almost all golfers. I can’t remember how many shots Jack Nicklaus claimed he could knock off his Amateur playing partners’ scores, just by giving them advice on what shot to play. He felt that too many golfers were not just reckless with their decision making, they were “unthinking”. That is, they gave the shot no consideration other than how far was it, and what club do I hit (if I hit it true) to go that distance. On the other hand, some of you will start worrying that this is a complex skill with time consuming analysis that is going to slow down your round, and everyone behind you. Actually, it might shorten the time you take to play a round! In fact we can make this really simple. Let’s take all the Par 3’s for instance. Try playing the next few rounds without aiming at the flag once. On each hole make this a very simple decision process. How far is it to the middle of the green; where is the worse trouble, over the back or in the front? Club accordingly to get to the middle, but definitely take out the trouble (be inclined to club up if the trouble is at the front and vice versa). Now, aim carefully at the centre of the green, ignoring the flag position, and swing. Compare your total on the Par 3’s for the next few rounds with the previous rounds. And if you think your handicap is too good for this tip, then know that on tour there are some good golfers who follow this advice. If not, click here to book a lesson. My job is to inspire you to want to play golf more often, and to engage with you so that you play better golf. Better golf is more fun. You’ll get much more from your time on the golf course, if you are having fun. And a golfer having fun will want to play golf more often. It’s a great circle. And a golfer having fun will want to play golf more often. It’s a great circle. When I look at each golfer, my job isn’t to get them into a lesson or to sell them a new Driver. My job is to help that golfer find the easiest and fastest way to improvement that works for them. Improvement creates better golf and more fun. In fact that is the unique proposition of a PGA Professional. We aren’t there to ‘push’ something. We are there to ‘inspire’ you to play the best you can, to ‘improve’ your golf so that you have more enjoyment, to ‘include’ you in more activities, events and groups and to ‘increase’ the amount of golf you play, the amount of fun you have and the amount of value you get out of your investment in the game of golf. That is why we don’t sell equipment; we fit you to play your best. We don’t give lessons; we improve your golf swing. The result is better golf, improved performance, but above all, more fun and enjoyment. Challenge us. Come and hit some #5 or #6 Irons. Then let’s decide to improve the results you get. Let’s find a way to get that performance improvement as quickly as possible. You will have fun improving your golf and you know that the feeling of striking a better golf shot more often is worth having. Last week I was trying to encourage you to improve your swing fundamentals. If we can get you to improve those then you will hit the target more often with your Iron approaches. Many of you actually take the club away well and reach a very good position at the top with a good shoulder turn. Everything at this point is right. Possibly the club is sometimes laid open a little too often, but for most of you there is still the likelihood of a good golf shot. 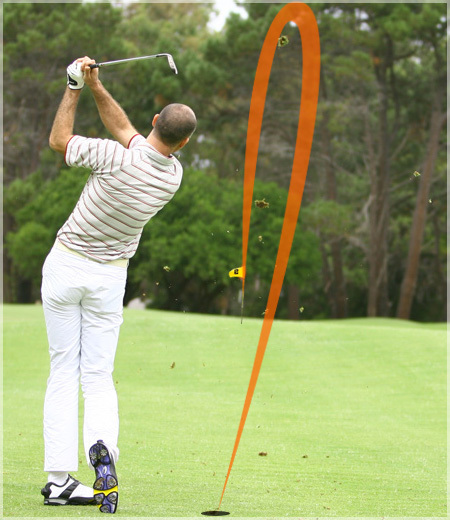 It is what happens next, as you transition from the top of the backswing, that causes many golfers a challenge. The first movement of many golfers gets their hands outside the correct line, making it impossible to get the club head to attack the ball from the inside with a good release. What then should happen, if you release properly, is a ball going left OR, if the hands try to get the ball square to the target line at contact, a big slice. In fact, what happens in a lot of cases is you start to try and steer the club head through the contact zone. Your hands become the ‘brains’ of the swing, trying to get as good a strike on the ball as possible. Three challenges here: real loss of power and distance as there is no release; there is no consistency in your swing and your ball striking becomes inconsistent; and you are almost certain to lose the ball right with a weak fade (and sometimes a slice). Let me look at your swing if you are experiencing inconsistent ball striking with your Irons. With a quick assessment, we can probably identify simple changes (such as the first movement in transition from backswing to downswing) that will really improve the results you get from your Irons. Contact me for an assessment.